Native Americans began receiving special emphasis in 1987 when the National Park began its first "Native American Indian Day" on September 26. Paralleling Ohio’s Native American Recognition Day, Mound City Group provided temporary exhibits and invited Indian volunteers for special talks. In connection with the National Park Service’s seventy-fifth anniversary, the park sponsored the "Hopewell Spirit Art Contest," awarding prizes to the best renditions of Hopewell culture. 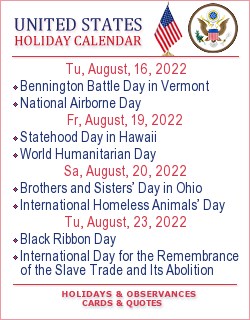 In 2019 Native American Indian Day in Ohio in USA falls on September 28.